The last real entry for naarmamo is a pair of fat little cats I bought from a Thai cafe which also sold a strange assortment of imported stuff. I was just going to buy one but I decided they came as a pair. They're not Thai as that's a different alphabet. 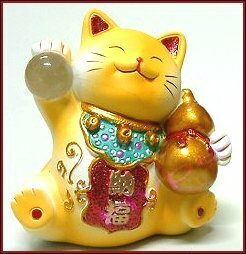 I thought they were Chinese, but googling seems to show more hits for Japanese maneki neko. So far I haven't seen any like these though. YELLOW cats beckon for good health, stability, & good marriages. One of my bestest feel-goodest cats! Everything about this guy says "HAPPINESS". He's bright yellow (for "wealth") with colorful detailing, holds a crystal ball (a symbol for "purity") & also a lucky gourd (for "longevity"). His smile & body language are right on. 2.5" (6.5 cm) tall, painted ceramic. ID: Embossed in an oval beside his tail is "Kao / Miao Chuang". Purchased new from Taiwan. One of mine has that oval which I'd never noticed before; the other has a butterfly in an oval. "Miao" BTW is a Chinese name; I had a friend called that. I think "kao" just means clay. And look: two more yellows and two orange ones, different again! They're a good choice for today as the orange one looks as if she's waving goodbye. They're supposed to bring good luck and wealth, but so far they haven't worked. :-P I like them anyway. They make me smile. I was pleased at finding that brush that does speckles yesterday as it added glitter to the red bits. They're mainly matt with parts painted in metallic paint, they have paler cheeks and paws, and they're holding glass balls for some reason. I've had to glue one back on since I bought them.